Richmond native Will Roberts was perfection personified Tuesday as the University of Virginia junior right-hander hurled a perfect game against George Washington in Charlottesville. To say the performance was a rare occurrence is an understatement. It was just the 19th time a Division I pitcher accomplished the feat, and just the eighth since 1957. Adding to the lure -- it was the 2,000th win in the school's history. Will Roberts records the final out of his perfect game against George Washington. 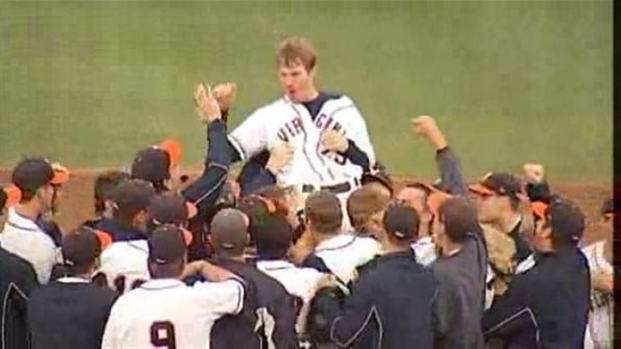 Roberts struck out 10, and after he got the final out on a grounder to second his teammates mobbed him on the infield and hoisted him onto their shoulders in celebration. "I had no idea what was going on," Roberts told the Nelson County Times. "I felt people grabbing my legs and I had no idea what they were doing and then they lifted me up. I wasn’t really expecting that, but I have the best teammates in the nation." Roberts was drafted by the Angels in the 49th round of the 2008 draft.